I spent the first half of my adult life (31 years) working within African government National Parks and Wildlife Management agencies. Over the remaining 28 years, I have written 15 wildlife books including five conservation textbooks – two of which are still being used in South Africa’s tertiary education institutions. I am also an investigative wildlife journalist. During my career as a government game warden I hunted and/or captured large numbers of Africa’s BIG-SEVEN game animals on government duty; including many stock-killing lions. I have also killed 6 man-eating lions. You might say, therefore, that my whole life has been steeped in Africa’s wildlife management affairs. NB: The True Green Alliance (TGA) – of which I am the CEO – has no affiliation with SAPA (the South African Predator Association) which controls the activities of the CBL Industry. This article, therefore, is an independent report measured only against my personal experience. 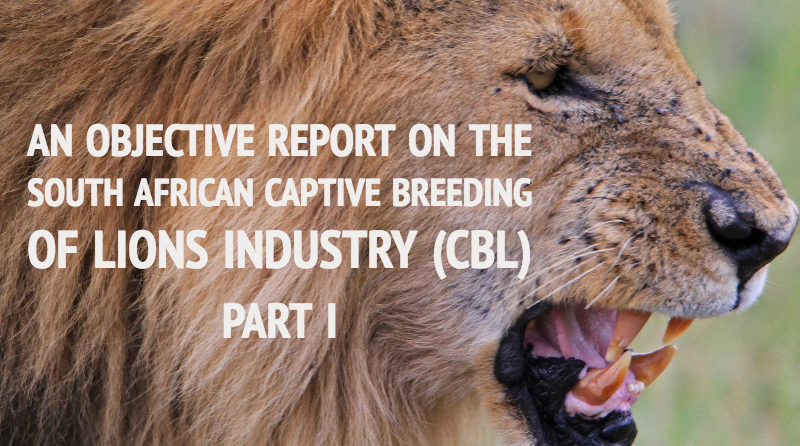 Until June this year, I knew nothing about the Captive Breeding of Lions (CBL) except the opinions expressed in a profusion of animal rights propaganda and the media – both of which grossly distort the truth. I wanted ‘facts’ – not a journalist’s ‘interpretation of the facts’ – and I could find none; or very few. So, I set out to find the truth for myself. In June 2018 – accompanied by TGA Director, Elma Britz – we carried out an inspection of the CBL Industry right across the Free State, and the North West and Limpopo Provinces. The intensity of this inspection can be gauged by the fact that in the first week of June, alone, we visited 19 lion farms in the Free State. In all three provinces, we probably visited something in excess of 40 lion farms – out of an estimated 200 country-wide. What we saw, however, represented a good cross-section of the industry; and I spoke to a lot of people who are involved in it. The practice of inviting young people from abroad to work on lion cub-rearing stations – at their own expense and for a handsome fee – when they are fraudulently told that the cubs they are tending will be ‘returned to the wild’. We visited two facilities that slaughtered lions and prepared their skeletons for export. This happens when they reach 30 months of age. They are sedated by a veterinarian; transported to the farm where the executions are to take place; and there, whilst still dozy, they are killed with a single .22 bullet, delivered at point blank range, through the brain. The killing, therefore, is 100 percent humane. The procedure, I believe, could be improved – but it works. I saw how the captive breeding of lions is carried out. Only two of the farms we visited still removed the cubs from their mothers within days of their birth – a state of affairs that is rapidly being phased out. All the other farmers keep the cubs with their mothers until they are weaned – at 4 to 6 months of age. Using lionesses as sausage-machine cub-producers is now frowned upon by SAPA members. At weaning, each cub’s DNA is registered and they are individually micro-chipped. This is a new and now automatic procedure. The DNA registration is carried out by the National Research Foundation of South Africa. I approve the direction in which the breeding operations are headed. Most of the breeding lions now have had their DNA registered; they have been fitted with microchips; and they are very carefully selected to reduce the possibility of inbreeding. The scientists have proclaimed that the 7000 to 8000 CBL lions have far better genetic diversities than any of the lions in our wild populations. They are also free of disease; compared to the Kruger National Park lions which are seriously infected with incurable Bovine TB. I inspected several of the CBL hunting camps. They varied in size from 1000 to over 10 000 hectares. They comprised many different natural habitats in which the ground varied from soft Kalahari sand; sandy loam; hard clay loam; gravel; and what can only be described as loose-pebble-beds. Following lion spoor under some of these conditions, I concluded, would test the mettle of Africa’s most accomplished trackers. All the hunting camps were well stocked with wild game animals. The hunting of captive-bred lions in South Africa can only be carried out using the walk-and-stalk method. This involves the hunter following the lion’s spoor, on foot, until he catches up with his quarry. (5) to shoot a lion from a vehicle. So hunting these lions is NOT a walk in the park. This is a far cry from the picture of ‘canned lion hunting’ that the media likes to portray. I spoke to several visiting hunters. They all understood they had come to South Africa to hunt captive-bred lions. None were under any other illusion. None complained. All of them offered praise. One hunter, using a pedometer, on his first day out had followed his lion for 37.5 kilometres; and he didn’t get his lion! The average daily lion hunt covers a tracking-pursuit distance of between 15 and 20 kilometres. On some days the hunter ‘gets lucky’. Some hunters, however, never get their lion no matter how hard they try. So, sometimes, the lions ‘get lucky’! Once newly released lions have killed for themselves – which, even though they had never killed before, sometimes happens within an hour of them being released – they generally prefer to avoid contact with man. On several occasions I followed the tracks of a single lion in a hunting camp; and when it knew we were following it, the lion took evasive action. We heard rumours during the survey of a maverick farmer enabling 6 lions to be hunted on his property in one day (another source said the number was 12) and every one of the SAPA members who heard this news were very disturbed. All the lion farmers told us that captive-bred lions ‘return-to-the-wild’ very easily. In one experiment – on a 38 000 hectare game ranch called Matlabas – one adult male and four non-pregnant adult female captive-bred lions, had been released some 19 months before our visit. They had never killed before; they were never fed; and they have all survived. Two of the females had moved away – individually – to live on their own. They had both given birth to four cubs, two of which in each litter, had died. The other group, the male and two females, had stuck together and produced another five cubs of which four had survived. So, of the 13 cubs born to these four females, 8 had survived; and, now over a year old, the cubs are all fit, fat and healthy. The adults, too, are in excellent condition. NB: Propaganda is: “The spreading of ideas, information or rumour for the purpose of promoting an ideal – or injuring an institution, cause or person – by any means true of false”. So, there is nothing good or wholesome about propaganda. It always has a sinister purpose. Propaganda stories explaining that newly released lions run towards the sound of the hunter’s approaching vehicle, looking for food, are rife. These are mischievous fabrications designed to give the impression that the lions are tame; that they are still being fed; and that they are innocently running towards their hunter-executioners. Rumours also persist that ‘canned lion hunting’ – the shooting of lions in very small camps or in backyard cages – is still being practised. Not to my knowledge, it isn’t! And SAPA certainly does not support that practice. And it is now illegal. Captive-bred lion hunting & fair chase. Does the foreign hunter get a ‘fair-chase’ experience when hunting a captive-bred lion? I believe the practice can be assigned a reasonable degree of ‘fair-chase’. Far from perfect but good enough! Certainly, the ‘adrenaline rush’ that a hunter experiences when he hunts a captive-bred lion on foot in South Africa will be greater than he could ever hope to get when hunting a wild lion, from a hide, over a bait, anywhere else. Nevertheless, hunting wild lions from hides over baits is the normal and internationally accepted way of hunting a wild lion, even though the important ‘adrenaline rush’ that hunters seek may be inferior! Furthermore, I believe hunters have a much better chance of being attacked by captive-bred lions than they do when hunting a truly wild lion under the same walk-and-stalk conditions. Why? Because a wild lion will become fearful and run away when it is hard pressed; whereas the captive lion will just get more and more angry! In England, 50 million captive-bred pheasants, and 10 million captive-bred partridges are released and shot every year by over 500 000 hunters. These are not free-range/fair-chase hunts but they are good enough imitations to give half-a-million upper-crust English ladies and gentleman the illusion that they are hunting real wild game birds. Even the British Royals are avid supporters. And this annual event brings in over two billion British pounds to the country’s GDP. The CBL hunting Industry in South Africa is well-incubated but still embryonic. It needs time and more experience to refine its practices and its procedures. But it is little different – in principle – to the shooting of 60 million captive-bred pheasants and partridges in Great Britain every year. If the ill-conceived demands of our animal rightist opponents are implemented – that South Africa close down its CBL hunting practices – it would only be fair to expect that they would then demand of Great Britain that it close down its massive captive-bred pheasant-killing-spree each year, too! And I don’t think that is going to happen. The CBL Industry holds great promise for our rural economies, especially in the lion bone trade. For the effort of rearing just 10 six-month-old cubs – to 30 months of age – for example, a rural community could earn itself half a million Rands; and SAPA stands ready to help make that happen! Bear in mind that, if South Africa does not snare this huge and lucrative market for OUR people, some other African country will grab it, with both hands, and use it for the benefit of THEIR people. As to accusations that the CBL Industry has badly damaged ‘BRAND SOUTH AFRICA’, I have to point out that SAPA has not ever drawn unnecessary attention to itself either in South Africa or abroad. Just the opposite! It has proceeded to develop the CBL industry peacefully and quietly, as best it can, in the face of some terribly powerful, unjustified and very vocal opposition. Those who have been consistently telling the whole world that South Africa is a BAD COUNTRY are the same people who are fighting to have the CBL Industry destroyed. They are, principally, South Africa’s own animal rightists. And they have not minced their words. Amidst their propaganda they have fabricated many stories that are simply not true. So, if South Africa has lost international credibility because of the CBL Industry, the reason comes from the mouths of the animal rightists. I hope, therefore, that Brand South Africa will join me in condemning any animal rights propaganda that is detrimental to South Africa, to South Africa’s people, and to South Africa’s wildlife. At the parliamentary colloquium on CBL held in August 2018, the Director of ‘Brand South Africa’ stated that it is highly unlikely that the existence of CBL has had any detrimental effect on South Africa’s reputation abroad; and that such an idea was simplistic. Thus was the animal rightists’ terror-tactic propaganda officially debunked. What is an animal rightist? An animal rightist is someone whose purpose in life is to ABOLISH all animal uses by man; who insists that animals have the same right to life as humans; that man has no right to ‘use’ animals for his own benefit; and that man should subsist on a vegetable diet alone. NB: Animal rightists cannot attain their objectives without violating the legitimate rights of other people. And, that being the case, there is no place in any civilised society for the animal rights doctrine. The difference between animal rights and animal welfare is profound. They are not one and the same. The animal welfare person acknowledges that man DOES have the right to use animals for his own benefit – but with provisos. He says that when man uses a live animal – like a horse to pull a cart – there should be no cruelty involved; and that when he kills an animal to obtain meat to eat, the killing process should be humane. Animal welfare people, therefore, oversee man’s civilised standards when it comes to his ‘use’ of animals; and that should be welcomed by us all. The vociferous outcries of the animal rights activists are not representative of general public opinion in South Africa – especially African opinion. Like fraudulent zealots of every kind, everywhere, they are rebels who are prepared to use any cause to make money out of a very vulnerable, gullible and uniformed public. The CBL industry is not the rogue, illegal and criminal activity that it has been made out to be. It is a legal agricultural-type livestock business that has been developed within, and closely regulated by, South African environmental and wildlife management legislation. Furthermore, it is conducted within the internationally recognised and accepted principle of sustainable use. NB: Here is the crux of the conservation truth: The CBL industry has nothing to do with the management of wild lions. It neither detracts from nor augments the existence of wild lion populations. Propaganda statements to the effect that CBL has a negative impact on wild lions, therefore, are mischievous and fraudulent. The industry maintains, however, a reservoir of very healthy breeding stock should lions ever be required, for whatever reason, anywhere in Africa. There are one or two rogue elements still operating within the CBL industry. It is these mavericks who continue to give the industry a bad name and who are providing the animal rightists with all their ammunition. People in the industry – who WANT to clean up the industry’s act – believe these dissidents are still around because the provincial governments have not done enough to rein them in. The officials are – I am told – supposed to be present at each and every lion hunt; they are required to monitor breeding and translocation activities; they should be auditing hunting registers; and they must sniff out and prosecute illegal activities. But – I am told – they don’t do any of these things properly; and when officials do arrive to oversee a hunt they are often too scared to even leave their transport. Furthermore, they often don’t recognise the irregularities that some of the rebel farmers are conducting right under their noses. All these factors work to the detriment of the CBL Industry’s reputation. The CBL Industry is a multi-million rand business. It is run by highly successful businessmen who are putting all their energies and finances into making their very expensive lion farming enterprises work. And the entire industry is stalling because the Nature Conservation officials – who are supposed to assist in the process of making the industry succeed – do not seem to understand just how injurious their sometimes vexatious, sometimes too laidback, activities have on the industry. Yet, they have the power to make or break this industry; and not one of them can be held accountable for his or her actions. This state of affairs needs to be properly investigated and remedied. This industry has huge potential for South Africa – especially for our rural folk – and it is worth government releasing the industry from its quagmire of unnecessary over-regulation. The industry – which SHOULD BE a single ‘national endeavour’ – is struggling to comply with the often VERY DIFFERENT demands from (potentially) NINE provincial Nature Conservation Departments that have no emotional attachment to CBL. Simple permit issues are a major gripe with the farmers. A four month delay in issuing an urgent and simple permit – such as a permit to hunt a lion – is just one example that makes dealing with these officials exasperating for the farmer. Among other things, each province requires export permits every time a lion leaves its province; import permits every time a lion enters its province; and transit permits when they pass through. The purpose of all these permits needs to be assessed; and those that are not really necessary should be discarded. NB: By comparison: If a cattle farmer in the Limpopo Province sells a prize bull to a farmer in the Western Cape all he has to do is load the beast onto a vehicle and transport it to its destination – from one end of South Africa to the other. As long as all veterinary requirements are met, there is no need for movement permits. So, why cannot that same procedure apply to the shipment of captive-bred lions? Captive-bred lions are not ‘wild’ lions; and they should not be treated as though they are. Over-regulation – too much red tape – stifles innovation and completely stalls development and improvement. When everybody is required to rigidly comply with often unnecessary and restrictive demands, new ideas cannot ever be discovered, tested or implemented. And so civilisation stagnates! I hope that the South African parliament will support the view, therefore, that government should sit down with SAPA and determine a better road forward. The ultimate answer is to empower the industry to regulate itself; and there is no reason why it should not. In many ways, the Minister, herself, holds the key to solving a lot of the industry’s problems. If she were, for example, to issue her lion-farm-operating permits only to people who are members of SAPA – that is, to people who would then be obliged to abide by SAPA’s government-approved norms and standards – there would be no maverick outlaws ‘doing their own thing’ in their private back yards. In one stroke of her pen, the Minister could achieve that miracle. And following that one move, SAPA would make sure that everything else falls into place. NB: Concomitantly, I would recommend that select members of the SAPA Board be appointed honorary officers of the Department of Environmental Affairs – answerable to the Minister – with specific responsibilities towards making the CBL Industry work in accordance with government protocols. At the moment operating permits are issued to people who are NOT members of SAPA which is why some CBL farmers have been empowered to run rogue. The industry already contributes R500 million to this country’s GDP; it is in compliance with the sustainable-use objectives of South Africa’s National Conservation Strategy; and it aligns with the provisions of our National Constitution. For a multitude of reasons, therefore, South Africa should be nurturing this infant industry not thinking about closing it down. that the animal rightists have no interest in the benefits that could be made to flow to South Africa’s rural people if CBL was fed into their domain.